It’s been another action-packed week in the Premier League as the festive season brought lots of matches and even a sacking or two. It was inevitable; one of the weirdest and worst managerial appointments in the Premier League has come to an abrupt end after just 81 days. Bob Bradley had a poor run at Swansea City, conceding 29 goals in 11 games, leaving the club with no choice but to sack him after a 4-1 loss to West Ham at home. The South Wales side will now be on a search for a new manager to save them from the relegation battle they have found themselves in. The bookmakers have Chris Coleman, Ryan Giggs and Alan Pardew as some of the front runners for the Swansea City hot seat. That Jurgen Klopp charm continues to woo the Liverpool fans and his sides performance against Stoke did the same. A 4-1 thrashing of the mid-table side highlighted his team’s ability to score and play exciting football, a style of play which is becoming a trademark for Liverpool. Although Chelsea seem untouchable for now, Liverpool are keeping their foot in the door with plenty of high scoring performances. Players such as Roberto Firmino and Adam Lallana will remain key for Jurgen Klopp as Liverpool’s problem seems to be squad depth, given their replacements do not bring the attacking threat needed for a title race. Although their Champions League campaign is going perfectly to plan, Leicester City’s Premier League form has gone from bad to worse with a 2-0 loss to Everton at home. Star players such as Kasper Schmeichel, Riyad Mahrez and Wes Morgan have been a fraction of the players they were last season, which is causing the downfall of this season. Leicester are now genuine contenders for relegation and seem to have been tactically found out by plenty of Premier League sides. Ranieri will need to use the January transfer window to strengthen his poorly-performing side and add healthy competition for places in the starting side. Henrikh Mkhitaryan showed his class on Boxing Day with a stunner against Sunderland. An acrobatic finish at Old Trafford had every spectator off their feet applauding the brilliant skill and initiative shown for the goal. After an odd beginning to his Manchester United career, he is quickly becoming a certainty in the starting side for the Reds. He brings great dribbling and vision as well as decision-making to Manchester United’s attack. Jose Mourinho is now seeing the benefit to his many summer signings with Paul Pogba, Zlatan Ibrahimovic and Mkhitaryan’s impressive recent form. Sam Allardyce did not get his dream start as Crystal Palace manager this Boxing Day. His side took the lead early after a great run from Andros Townsend was finished by Yohan Cabaye however Troy Deeney found an equaliser and wiped the smile off Big Sam’s face. It will take a while for Allardyce to make a big impact at Palace as there are a lot of aspects that need improving. 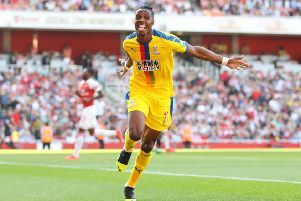 Sam will be looking forward to the January transfer window, where he will be able to strengthen the clear defensive weaknesses at Palace and attempt to get the best out of his Belgian striker, Christian Benteke.